Home » PortraitswithPurpose » Order “The Fabric of” Book Today! If you missed pre-ordering the The Fabric of Raleigh/The Fabric of Durham book during the Kickstarter campaign (which ended July 12) fear not, the book is now available for purchase here! The book ships in August 2017. The “The Fabric of” book is a 120-page high-quality hardcover book by Raleigh portrait photographer Christer Berg and published in collaboration with fine art book publisher Horse & Buggy Press of Durham, North Carolina. 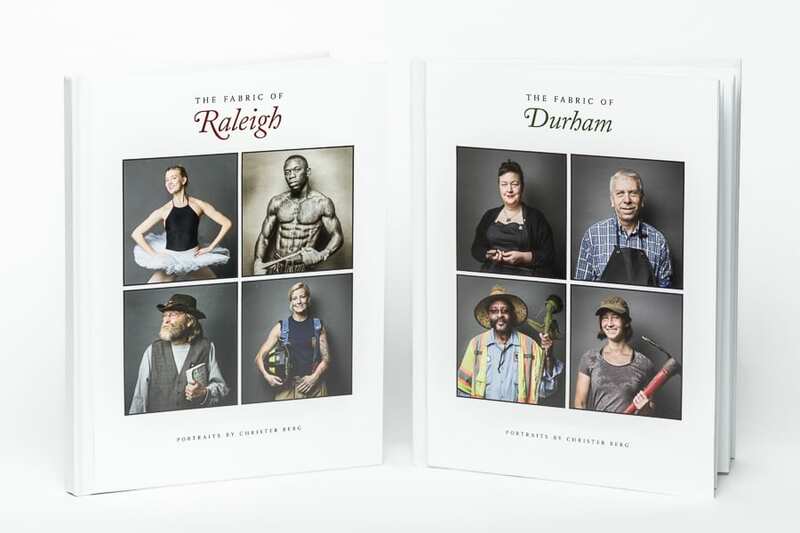 The book features both the The Fabric of Raleigh and The Fabric of Durham series, and includes more than 45 full-page portraits, plus numerous behind-the-scenes photographs, stories, quotes and essays. Each series has its own book front cover, making it a reversible book – a so-called tête-bêche format. Thus, as both series are of equal importance and deserve their own front cover, the two series meet in the middle, mirrored! With a trim size of 11 3/4″ tall by 9″ wide, the casebound (“hardcover”) book is Smyth sewn instead of glued, for strength, durability and making it easier for the spreads to open and lie flat. The images are reproduced via full color offset printing on high-end 102 lb. GardaPat matte coated paper which assures the highest possible quality. The pre-order price for the book is $44, a 25% savings over the $59 MSRP. « A Visual World It Is – Use it to Your Advantage!